I love summer, and when I think of summer, I think of the Beach. Bugaboo Digi Stamps make a series of adorable Mermaid and fish themed stamp set called, “UNDER THE SEA BIRTHDAY SET“. I made a series of cards utilizing all the cute images. I coloured them with Copic markers and layered them on papers from my stash. The sentiments are from the same set. Please check out Bugaboo Stamps. You will be amazed. Note: They constantly are introducing new images and retiring old ones – don’t miss out and be disappointed. I personally own over 50 of their images with 25% no longer a part of their collection! Bugaboo is this week’s sponsor, please support them. Friday’s are Freebie Fridays! I purchased these black on off-white note cards from Michael’s, but I just had to tszuj them up with die cut birds, butterflies and dragonflies. I coloured them with Copics, added new sentiments, and inked around the edges with Distress ink. They were 4 cards per pack and only $1.00. 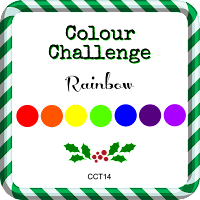 When I saw our new challenge was rainbow, I immediately thought of the Framed Snowman digi stamp by Dilly Bean Stamps. I tried to make him as colorful as possible even using Copic Makersand a colourful Striped background. The sentiment is from Penny Black – Festive Snippets. This challenge will last for the whole month of July 2017 – anything goes as long as it’s Christmas – it doesn’t have to be a card, you can link any project as long as it’s Christmas! For my card I started by creating a night sky. I did this by using watercolour paper. I taped it down to a flat surface. I wet the paper using a wide paint brush, then using a round brush added various random spots of colour – yellow, pink, orange, blue, purple. Once dry, I added the top with black leaving bits of the colour to peek through. I left it dry again, then splattered white ink to act as stars. I used Zig Kuretake Gansai Tambi watercolours. Next I coloured a Bugaboo stamp*, called “WRF Up” *this stamp has been discontinued. Bugaboo added new stamps monthly, and several times a year discontinue older images. Check out their site, and sign up for their weekly newsletter! I fussy cut him out and added him to my night sky. The sentiment is from Whimsy Stamps.